The CASSP newsletter keeps site stewards and other interested parties informed of program events and volunteer activities through the SCA Newsletter, this web site, the CASSP e-mail list, and the CASSP page on Facebook. 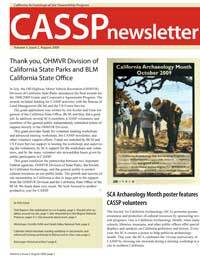 The CASSP newsletter is no longer being published, but past issues can be downloaded for viewing or printing. The newsletters are Adobe Acrobat PDF files. The free Adobe Acrobat Reader program is available from www.adobe.com/acrobat. We do not sell or share information from our mailing list to outside organizations.